This French tapestry "Spring Arch" shows an urn of flowers in a garden scene with taupe border. This scene shows a colorful urn of flowers, set on a white ornate architectural pedestal. A lattice of green grape vines decorate the scene. A detailed border surrounds the scene beautifully. 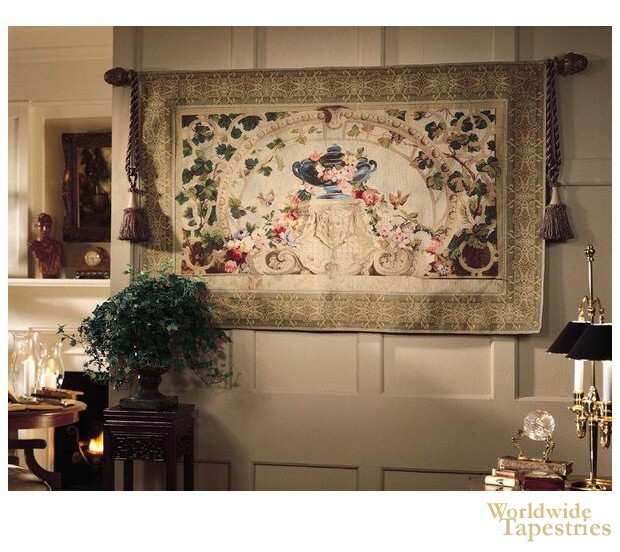 This French tapestry "Spring Arch" is backed with a lining and has a tunnel for easy hanging. Note: tapestry rod and tassels, where pictured, are not included in the price. Dimensions: W 61" x H 40"